A titration is a process used to determine the volume of a solution that is needed to react with a given amount of another substance. In this experiment, your goal is to determine the molar concentration of two acid solutions by conducting titrations with a base of known concentration. You will be testing a strong acid, HCl, solution and a weak acid, HC2H3O2, solution. You will use the sodium hydroxide, NaOH, solution that you standardized in Lab 6 as your base of known concentration. The reaction equations are shown below in net ionic form. The stoichiometry of the two reactions is identical; thus, your calculations will be straightforward. However, you will observe a significant difference in how the two acid solutions react with NaOH. 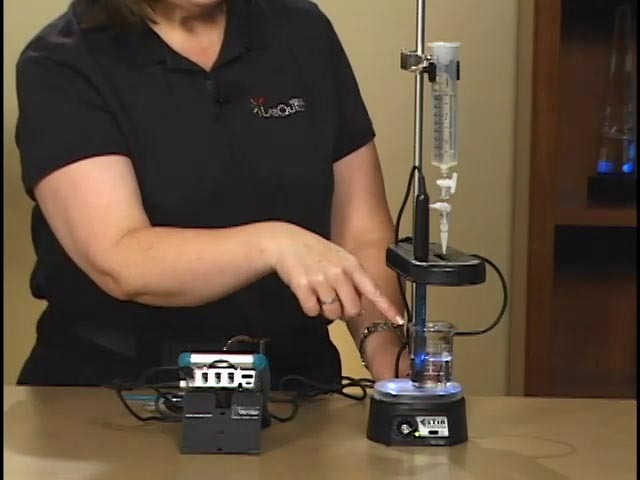 In this experiment, you will use a computer to monitor pH as you titrate. The region of most rapid pH change will then be used to determine the equivalence point. The volume of NaOH titrant used at the equivalence point will be used to determine the molarity of the HCl solution. Determine the equivalence point of a strong acid-strong base titration. Determine the equivalence point of a weak acid-strong base titration. Calculate the molar concentrations of two acid solutions.